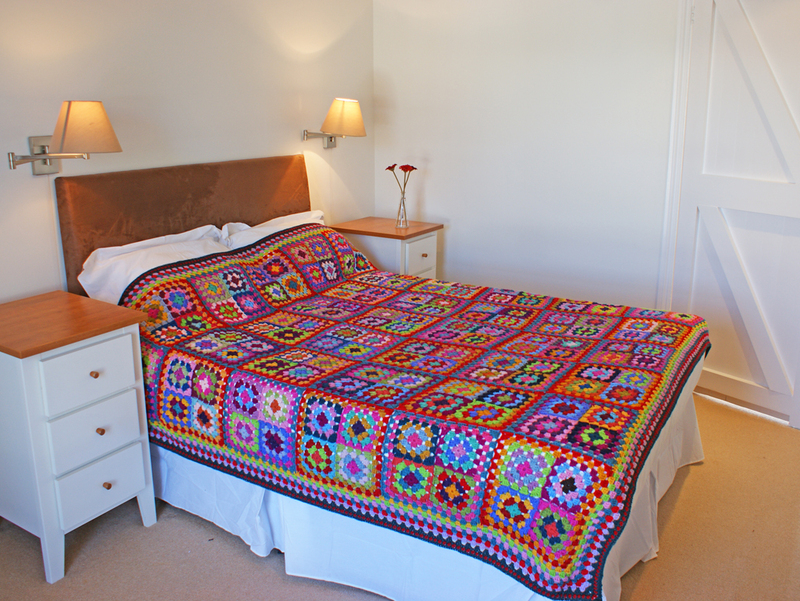 Is this the most colourful crochet blanket ever? There are 42 big squares in a 6 x 7 pattern. 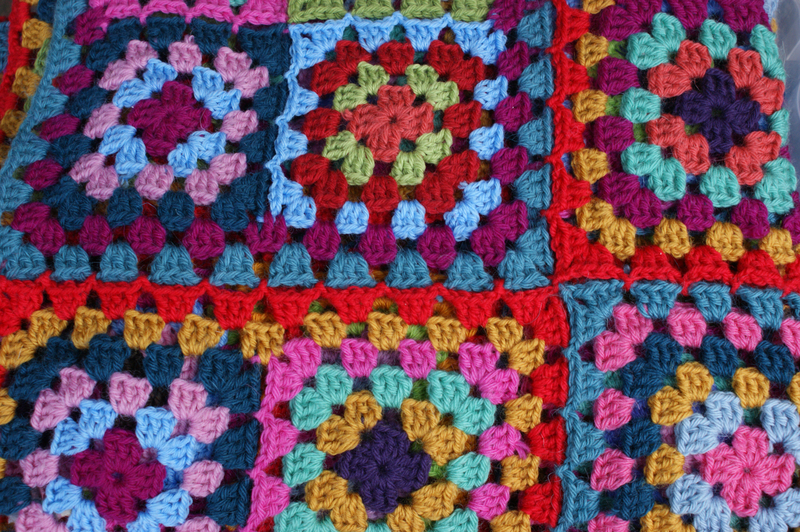 I worked an outer border of 7 rows, following the granny square pattern and then added my favourite Tweed Stitch border with scarlet and teal. 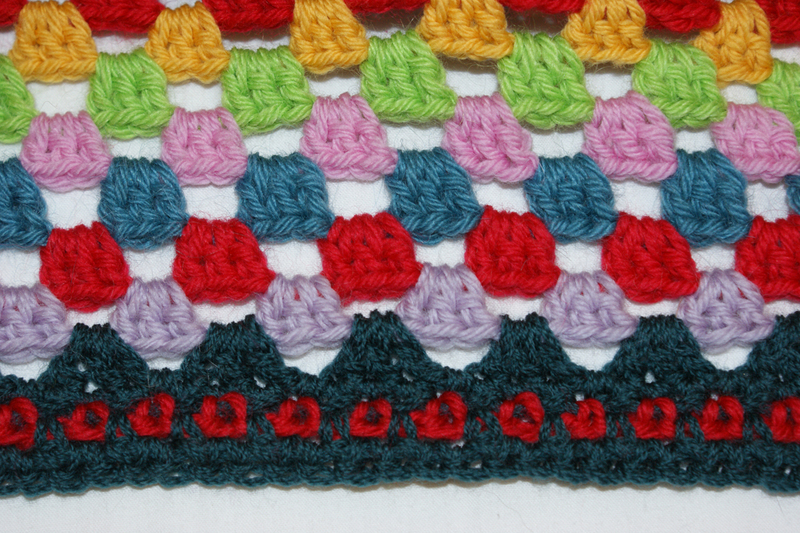 To make the border lay flat and prevent it curling up, I always work a final row or two with the wrong side facing me. Similarly, the scarlet row in the outer border was worked with wrong side facing – that’s what makes the stitches look like ‘V’s! The yarn deserves a very special mention. It’s the remaining yarn from my Gypsy Rose blanket – Julia by Kristin Nicholas. Julia Yarn is now discontinued but like Phoenix has risen again and goes by the name of Color by Kristin. It really is the best yarn I have EVER used. Apart from the stunning colours – and they are truly stunning – it’s the perfect weight and texture. My remaining 30 balls of Julia yarn were eeked out with some other pure wools, but I made sure that every square had at least a couple of Julia rows. I treated myself to some vintage Jaeger Matchmaker in Teal, and that’s the outer border – luscious. 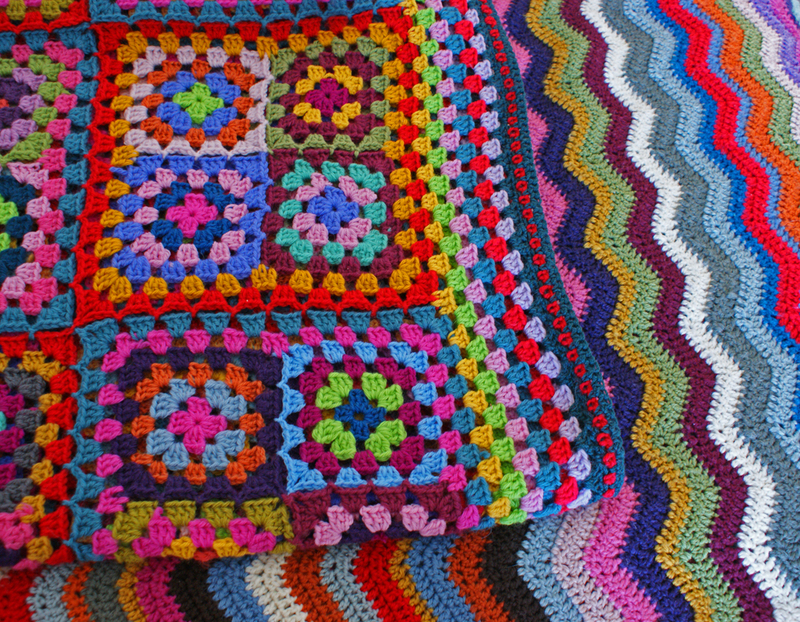 I can’t tell you how much I love the colours in this blanket. Kristin, lives her whole life in colour – see her home here in Houzz. I love visiting her blog to hear the vivid accounts of life on a sheep farm in Franklin County, Massachusetts, her collie dogs, workshops and latest designs. Do pop over to Handmade Monday (No 104) later on, to catch up with all the other ‘creatives’. I’m going to walk the dogs on the beach and decide what to make next. My sewing machine, a neat stack of fabrics and just one bag of wools came with me on holiday! I’ll be showing you some pictures of my just-completed Songbird Quilt in a day or two, so do pop back. Anchor Cottage, on loan for a photo! 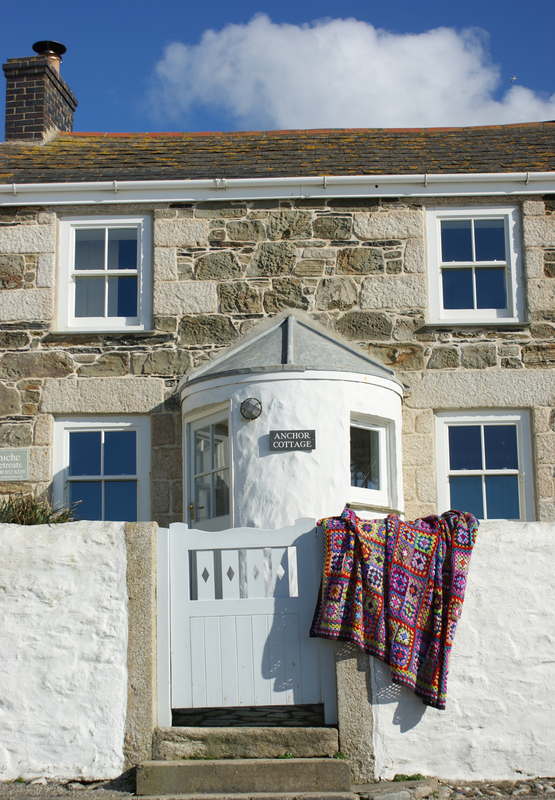 Yours, in a cottage by the beach in sunny Cornwall! Oh my goodness – this turned out stunning! No wonder it took you a while. It is HUGE! 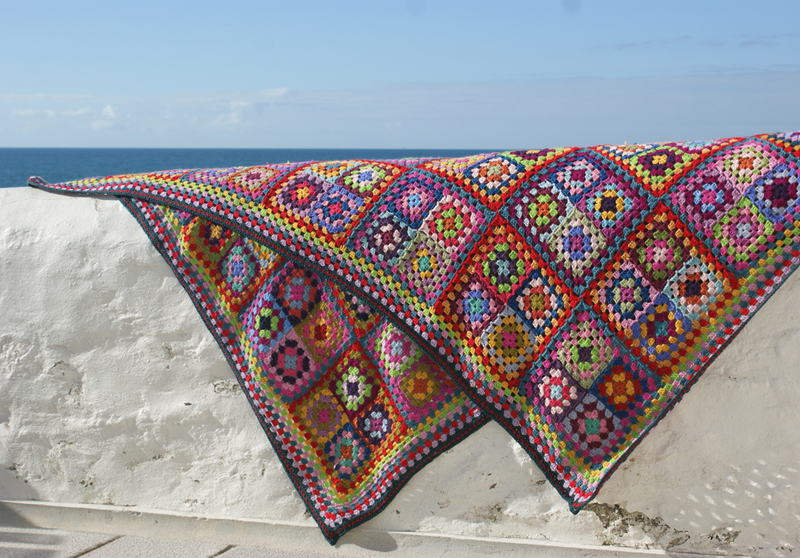 Just love the grannies and the borders and the crazy colors! It is my dream one day to make a blanket or two for a bed. You are an inspiration! I am going to share this on my blog and FB page. And of course point people to your blog! Congratulations on such a great job. Gorgeous photos too! Thanks Kristin – you’re the inspiration! 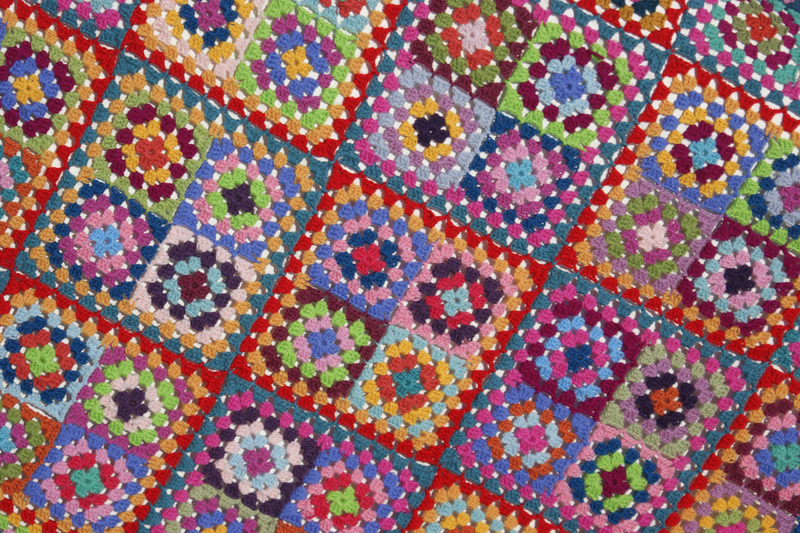 It’s those colours – there’s no yarn like them anywhere. Thanks so much for the lovely comments. Wow – this must have taken you ages. There is so much work here but well worth the time and expense. I really love the border in particular. I really hope that it brings you a great deal of joy over the coming months and years. I do love your outdoor shots – the colours are just so vibrant! Oh my word, it is gorgeous. I love the riot of colours. Your lovely photos have set it off beautifully, too. Anchor Cottage looks a lovely place! Your blanket is beautiful, it does look amazing on the bed. And all the colours are wonderful. Thanks for letting us know about Kristin’s blog just having a quick peak I could see it’s a colourful place. Have a lovely week. Absolutely beautiful and I love the photographs you have taken – they really set of your work very well. Hope you have a good week. Imagine the Technicolor dreams you’d have sleeping under this! Hooray for Julia’s yarn coming back – bad call on Nashua’s part to drop it–viva Julia & Kristin! Your blanket looks perfect on the bed, just because the rest of the room is so white. One great big splash of colour. Couldn’t agree more – just shows that there’s a need for outstanding yarn – viva Julia & Kristin! Wow – colourful or what !!!! Because the bedroom is white, it really shows off the colours. I bet it’ll keep you nice and and warm too. 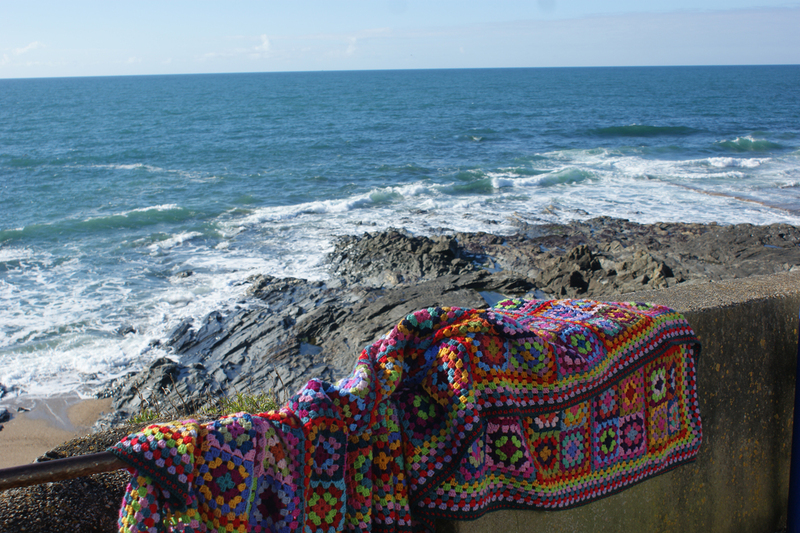 Gorgeous blanket in a gorgeous location! I love how striking it looks on the cottage wall and on the bead- beautiful! Oh wow!! This is just stunning! 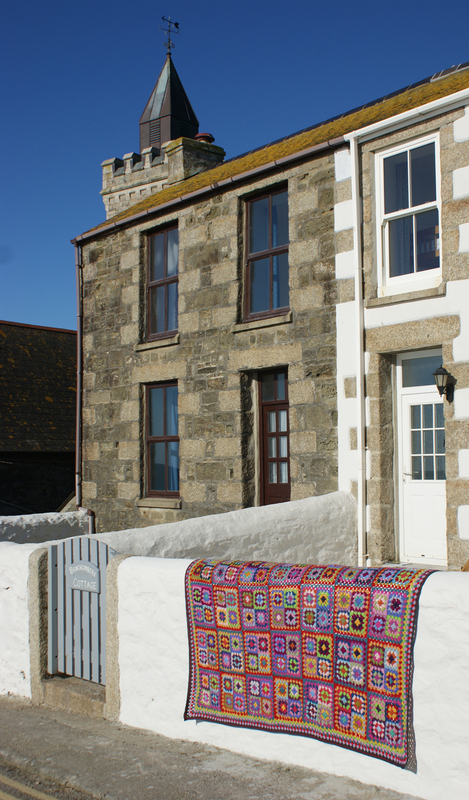 I especially love the photo of it draped over the white wall in front of the houses.. sooooooooo pretty!! Wow oh wow the colours are so brilliant, I adore the photo’s. 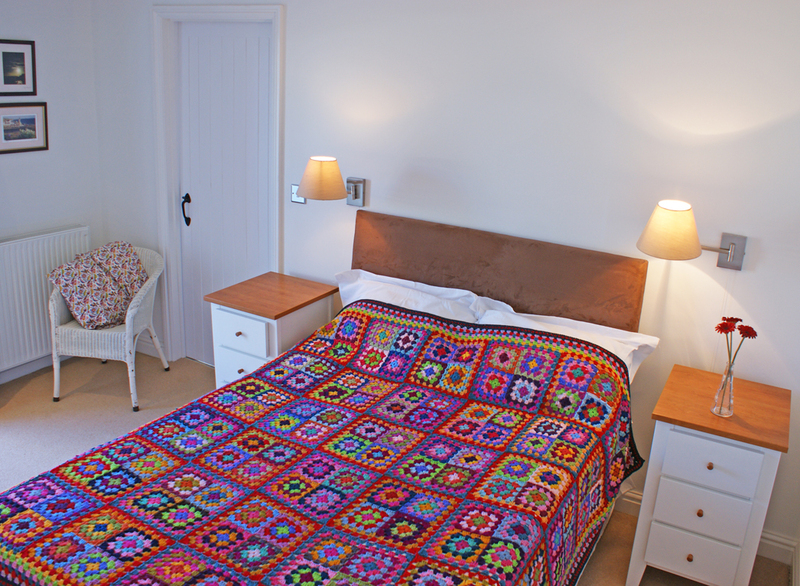 Anchor Cottage looks such a pretty place, I love the finished songbird quilt too. Oh my word!!!! 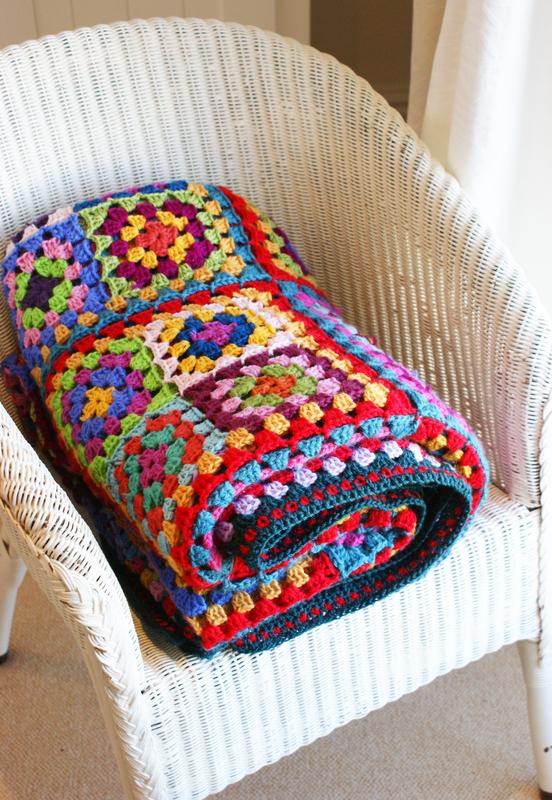 This blanket is a crochet masterpiece! Absolutely stunning and a real wowser! I imagine all that hard work than went into making it. The place the photo session took place is wonderful too. love the photo with the sea in the distance. What a magnificent view! Just do it – crochet is wonderful. I’m going to teach classes later on this year and I can’t wait to do some converting! Absolutely beautiful! I’ve just started a blanket … only got 2 squares so far, am a bit daunted by it now! It didn’t take me that long. Joining the squares as you go is a great time-saver. I also found that I could make a big square (4 small ones in a block) most evenings without any hassle. It grew really fast – about 6 weeks altogether. Its an amazing blanket and a fantastic achievement. I love the colours and your photo’s are really inspiring too! Wow those colours are great. I know just how time consuming it can be to make a blanket, but so satisfying once it’s finished. Oh I am so jealous of your beautiful surroundings! I am here in sunny palm tree California but my heart is in England. Beautiful blanket. I’m looking forward to following your blog. Have a great week. Lovely quilt, I’m a sucker for anything red and your quilt certainly hits the spot. Great free motion embroidery. (it is strange how the eye turns the stitching t’other way around, I’ve had the same problem) Lovely photos as well. What a lovely quilt. I love the colours, and the little details. I am trying to work out where you live. How is it so gorgeous and sunny? We were on holiday in Cornwall last week and the sun shone EVERY day. It was still bitterly cold though! Can anyone direct to a tutorial on how this was connected? Hi – I’m not sure what you mean? If you email me info@adaliza.co.uk I’ll let you know if I have any details. You are currently reading Carnival time at Adaliza.